A lesson is 'completed' when you have taken the test for that lesson and obtained the minimum pass rate. You can then move on to the next lesson in your personal study plan. You can easily see, both in your study plan and on your dashboard, which lessons you have successfully completed and which ones you still need to study or revise. 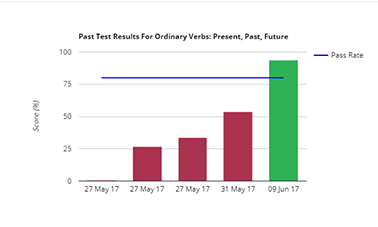 Each time you take the test for a certain lesson, your score is recorded in a chart so you can track your progress in each topic through time. Our goal is to help you achieve 100% on every test by giving you detailed feedback on your test results. 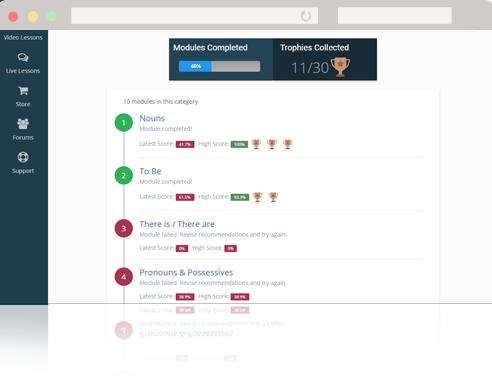 Our feedback system highlights your mistakes, gives you some tips, and directs you to the section(s) of the lesson that you specifically need to revise. After your revision, you must retake the test for further feedback and guidance.